There are so many different reasons to visit Los Angeles. The City of Angels is one of the most popular touristic spots on Earth, home to some of the best beaches and attractions in all of the North America, as well as being famous for its movie studios and celebrity residents in places like Hollywood and Beverly Hills. Another hugely significant and unique part of Los Angeles is Venice Beach. Venice, named after the romantic Italian city of the same name, is a residential and recreational neighborhood in Los Angeles' Westside region. It was founded back in the early 1900s as a simple seaside resort area and was actually an independent city for a couple of decades before becoming part of LA. Nowadays, it's well-known all over the world as one of the city's most iconic neighborhoods for its endless array of street performers, vendors, artists, and more. It's a place for people to come and express themselves in almost any way imaginable, with Venice Beach in particular being the heart of the Venice area. It's at Venice Beach that you will find millions of tourists from all over the globe strolling along the Ocean Front Walk and admiring the various artists and performers at work, along with the muscular work-out fiends of the popular Muscle Beach area, the many sport courts all around, and the various shops, bars, and restaurants that offer even more fun opportunities for Venice visitors and residents. Venice Beach is a beautiful part of LA and a must-visit part of the city for any visitor, and it's also a good place to stay if you're looking for a hostel in Los Angeles. The hostels of Venice Beach offer quick and easy access to the beach and the Ocean Front Walk, as well as providing low cost accommodation and communal spaces where visitors can relax and get to know each other, sharing their experiences and even exploring the local area together. See below to find out more about a few of the best hostels in Venice Beach and the surrounding area. A highly popular hostel in the heart of Venice Beach, the Venice Beach Hostel immediately stands out from the crowd for its awesome location. In terms of Venice Beach accommodation, you really won't find a place with a better location than this one. 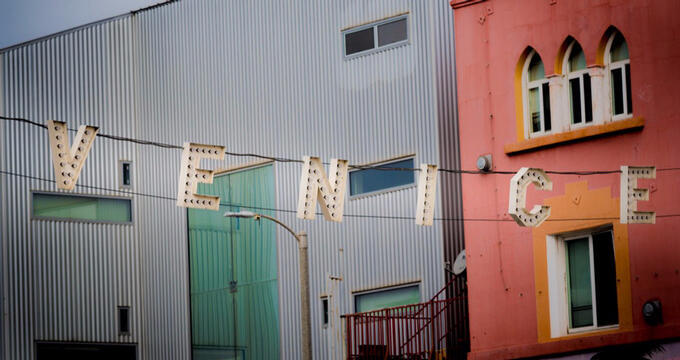 The Venice Beach Hostel is literally less than a minute away from the Venice Beach boardwalk, with key spots like Ocean Peak and Muscle Beach right next door, and plenty of good bars and restaurants nearby too. You won't need to rely on public transport at all when staying at this Venice Beach hostel, which features both private rooms and dorms all tastefully decorated to a respectable standard. The dorms feature bunk beds with comfortable bed linen and private reading lights, while the private rooms are a little more spacious with their own desks and night stands. You'll also be able to enjoy free meals at Venice Beach Hostel, which also provides a game room and a communal kitchen for guest use. If you've traveled around America a lot and often chosen to stay in hostels, the Samesun name should be quite familiar to you. Samesun runs a large network of high quality, affordable hostels in key locations all around the United States, with a great example right in the heart of Venice Beach. Situated on Windward Avenue, only a minute or two away from the artists and entertainers of the Venice Beach boardwalk, this hostel is in a great spot for people wishing to explore and enjoy this amazing LA neighborhood. As with many other Venice Beach hostels, you'll find both private rooms and dorms at Samesun Venice Beach, so can choose the style of accommodation that suits your needs, with room rates being very low and attractive all through the year. This hostel features its own bar and restaurant, so you'll always have place to eat and hang out with your pals, and you can also enjoy free Wi-Fi and free breakfasts here, along with the use of a shared kitchen. A laid-back hostel with a lot to offer, The Venice Beach HOSTEL is situated in a good spot for travelers wishing to explore Venice Beach and other nearby areas like Santa Monica and Beverly Hills. The Santa Monica Pier is only a 15 minute taxi ride away, while the Venice Beach boardwalk is just a few minutes on foot from this hostel location, with plenty of decent bars, shops, and restaurants in the local area too. Guests can choose between basic shared dorms with bunk beds or more spacious private rooms at this location. The dorms feature a couple of extra furnishings like storage areas and small desks, and they're very large too so can cater for big groups of friends and travelers. You'll also be able to enjoy a free breakfast when you wake up at this hostel to get you ready for the day ahead, with a communal lounge space and kitchen area also available for guest use at any time of day.